Dumneazu: Christmas in New York: Puerto Ricans, Jews and Chinese food. Christmas in New York: Puerto Ricans, Jews and Chinese food. "Saludos, saludos, vengo a saludar!" If you are a native New Yorker, that is what a Christmas carol sounds like. A real Christmas carol is sung in Puerto Rican Spanish, accompanied by pandereta drums - jingleless tamborines. This is plena, a style that originated in Ponce, Puerto Rico but has deep roots in Africa and is a crucial element in the New York Puerto Rican musical scene that eventually fused these local music traditions with Cuban son and rumba to create salsa. 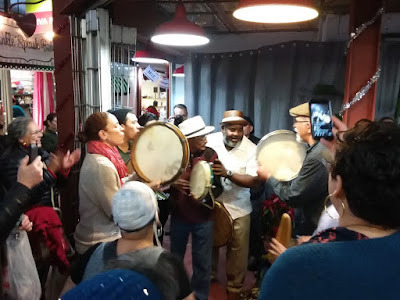 But at Christmas and New Year, bands of Pleneros still appear on the streets of El Barrio - East Harlem - to serenade local businesses serving the Boriqueno community. New York has dozens of ethnic communities who maintain their traditional music, and those from the many Latin American communities have settled in to become regular new York traditions. As always, we were tipped off by my buddy Bob Godfried - the reigning cultural ambassador of the Bronx - to the annual parranda procession by Los Pleneros de la 21, in East Harlem, and we were soon being serenaded by some of the best pleneros in New York. Puerto Rico has gotten a bad deal this year: their economic crisis was topped off by a devastating hurricane and a venal American President. Even now, months later, half the island has no power or phone service. We all watched that turd-eating assclown Trump on TV throwing paper towels at people in dire need, and taking twitter shots at the Mayor of San Juan. But the real venom of Trumps hatred of Puerto Ricans - which has deep roots in his background as a New York real estate developer - came out with his new tax law. It redefines Puerto Rico as a foreign country for tax purposes, essentially driving out any American businesses based on the island. The result will be more misery on the storm battered island and a growth in Puerto Rican emigration to the mainland - mostly to Florida, where they may easily tip the voter base to make the Cuban emigre supported republicans lose their majority on the swing state that brought us the last two Republican presidents. Mike Winograd, Dave Likht, Dan Blacksburg, Zillen Biret, Stu Brotman. Taking the #6 subway from 116th street in East Harlem we popped out at 14th Street, a few blocks away from the opening dance of the Yiddish New York Festival. when the legendary Klez Kamp event shuttered its doors in the Catskills, some of its most enthusiastic alumni - including clarinetist Mike Winograd, vocalist Sarah Gordon, and folklorist Peter Rushevsky - decided to organize a week of Yiddish culture taking advantage of New York City as a venue and using the magic trick that had floated Klez Kamp: Jews will always be looking for an event between Christmas and New Year. And thus one of the best teaching and jamming workshops happens in those grey days when little keeps us Yehudis busy besides ordering Chinese food and going to movies. This year the opening dance also celebrated the betrothal announcement of my Brother Nazaroff Dan Kahn and his bride to be Eva Lapsker. 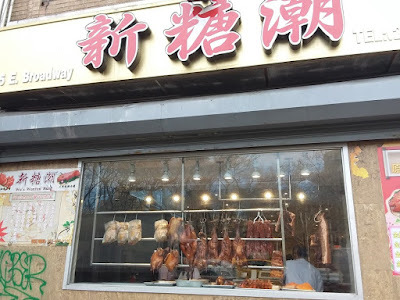 Serious followers of this blog (are there serious followers of this blog) will have already learned that I like Chinese food, Jewish food, anything Balkan, and cheeseburgers, pretty much in that order. Most of that I can not get in my home base city of Budapest, so while I am in NY I take advantage as much as possible. Christmas was, of course, Chinese take out, and Fumie and I have already been poking about in the Cantonese places that have been popping up east of Broadway, but more about that later. It has been a couple of years since I stopped in at White Manna Hamburgers in Hackensack NJ. Its located just across the street from the Giant Market - the huge Mexican/Korean bulk grocery where I buy my veggies while in Jersey, but it is usually packed with people ordering 30 burger lunches for the entire office. On Christmas Eve, however, its was quiet, and since the present owner is an Israeli guy, rather welcoming to visit. The real thing for Hanukkah! These are the tiny burgers that recall the great depression, when a tiny bit of meat was stretched with a mountain of caramelized onions and tossed on a soft potato roll to provide a cheap lunch. Today they sell for a whopping $1.60 for a single cheeseburger, up from $1.05 when I first wrote about them in 2006. This is the reason I don't do gourmet hamburgers. This is good, honest food. This is the taste of home. Thank you, New Jersey. Moroccan food at its best is one of the great cuisines of the world!